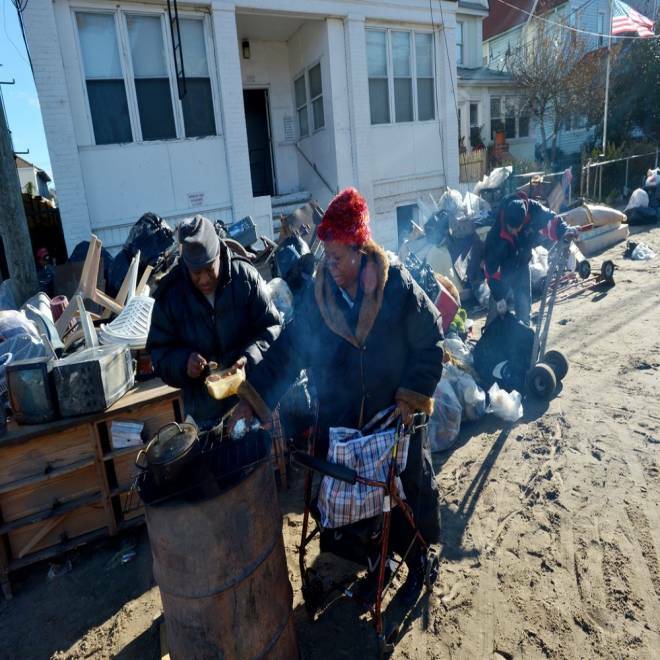 Collins Wimbish and Margaret Girgaud turned a barrel into a barbecue in order to cook food in the Rockaways neighborhood of Queens, New York, on Saturday. The Rockaways will dip to around 28 degrees overnight. Updated at 9:45 am ET: A "significant" nor'easter is likely to hit Sandy-battered areas of the Northeast by Thursday, the National Weather Service said in an update Sunday. FEMA and Red Cross officials have ordered more resources ahead of the storm, while New York City is dealing with a shortage of fuel oil and steam to heat buildings as temperatures began dipping into the 20s and power remained out for hundreds of thousands. At the very least, the service's prediction center stated, there is "a very real possibility of heavy rain and strong winds along the coast from Virginia to Maine." Snow is likely in the interior and some models "do bring some snow all the way to the coast as far south as Virginia," it warned. Power was restored to nearly all of lower Manhattan on Saturday, but it was still lights out for 2.3 million homes in other parts of New York City and the rest of the Northeast, especially Long Island and the New Jersey shore. In addition, "tens of thousands are without steam power and therefore heat," New York Mayor Michael Bloomberg said Saturday. "We want to get as many people into shelters as we can," he said, given the cold and the potential for a new storm that computer models now show being even stronger than forecast on Friday. Bloomberg also blasted the Long Island Power Authority, saying the utility "has not acted aggressively enough" to restore power, especially in the Rockaways. Overnight lows were around 28 degrees F in the Rockaways, 38 in New York City and 33 on parts of Long Island, NBCNewYork.com reported. Even in areas with temps above 30, 15-20 mph winds will make it feel like it's in the 20s. Temperatures Sunday and Monday were expected to be even colder just as critical heating oil supplies dwindle. "There's no heating oil around," said Vincent Savino, the president of Statewide Oil and Heating, which usually supplies some 2,000 buildings across New York City. "I don't know how much fuel we have left: maybe a day or two." Expected to be felt in the Northeast on Wednesday and Thursday, the storm would not be anywhere as destructive as Superstorm Sandy, but could cause some new erosion and hinder recovery efforts. Moreover, computer models are tending "toward a more powerful storm system for the East Coast Wednesday through Thursday," said weather.com expert Tom Niziol. Strong winds possibly topping 45 mph along the coast. High surf, which will cause additional coastal erosion. Significant snowfall from the Poconos through Catskills to Interior New England and Upstate New York. Continued cold temperatures with overnight lows in the Thursday time frame down to the low to mid 30s, even near the coast. He expected 1-2 inches of rain in coastal areas and 25-30 mph gusts on Wednesday, adding that the forecast could change. FEMA and Red Cross officials said Saturday they were mobilizing even more resources to prepare for the storm. The Home Depot has sent 5,000 truckloads of supplies into the East Coast since last Tuesday. Getting essentials to stores in ravaged communities takes a team of people working in what they call a "War Room." NBC's Gabe Gutierrez reports. In New Jersey, Gov. Chris Christie on Saturday visited crews repairing the berm in Little Ferry, saying a push was being made to seal it up before the new storm. Sandy tore up the berm, causing widespread flooding there. The U.S. death toll reached 111 on Saturday, officials said, after Sandy killed 69 people as a hurricane in the Caribbean. It struck the New Jersey coast on Monday as a rare hybrid after the hurricane merged with a powerful storm system in the north Atlantic. Consolidated Edison, a utility battling what it called the worst natural disaster in its history, restored electricity to New York City neighborhoods such as Wall Street, Chinatown and Greenwich Village in the pre-dawn hours. But some 11,000 customers in Manhattan were still without power. "There's enough light and activity to get a lot of people on the street and get rid of that movie-set look as if we're in some kind of ghost town or horror movie," Con Ed spokesman Bob McGee told NY1 television. With collapsed roads and destroyed homes along the New York area shore, the changes have altered the coastline and accelerated beach erosion. NBC's Kerry Sanders reports. In New Jersey, the utility PSE&G said 612,000 customers were still without lights after power to 1 million had been restored. Con Ed said it had restored power to 70 percent of the 916,000 customers in the New York City area who were cut off. The company was still busy assisting tens of thousands more without power in New York City's outer boroughs, where some people complained of being ignored. "We have nobody down here with video coverage," said Grace Lane, a grandmother who defied evacuation orders and rode out the storm in her second-story bedroom as water rushed through the first floor of her house in Broad Channel, a community in Queens. Eight people -- Lane, her husband, their two daughters, their husbands and her two grandchildren -- were sleeping on air mattresses on the floor of the upstairs bedroom, the last usable room in the house. "At least my children are OK," she said. In a city devastated by Sandy, holding a race through five battered boroughs just seemed like the wrong idea, according to officials. "I think there's a thin line between demonstrating resilience and being insensitive," one runner said. NBC's Stephanie Gosk reports. Many houses were gutted by 5 feet of floodwater that raced through Broad Channel, where residents hauled broken furniture and soggy belongings out of their homes on Friday. In a sign of security worries in the neighborhood, one garage full of debris stood open with a sign next to it reading: "LOOTERS WILL BE CRUCIFIED - GOD HELP YOU." Moving to ease fuel shortages, the Obama administration directed the purchase of up to 12 million gallons of unleaded fuel and 10 million gallons of diesel, to be trucked to New York and New Jersey for distribution. 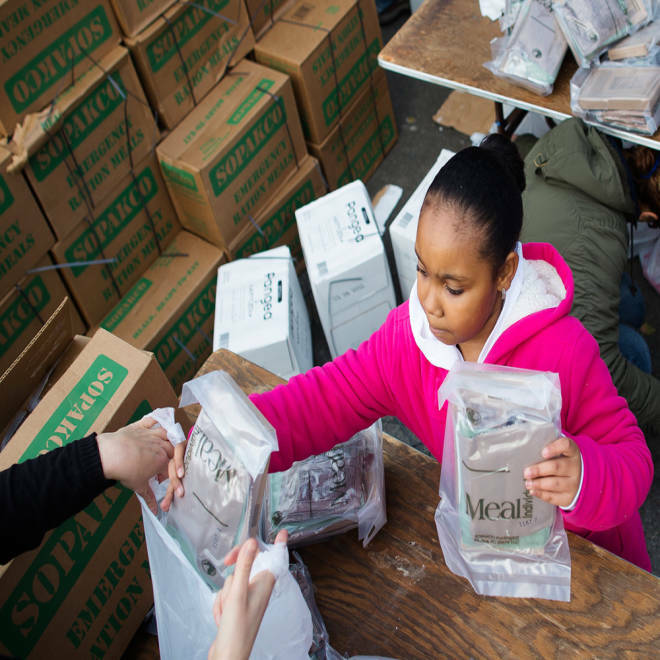 With hundreds displaced by the storm, crucial necessities are being supplied to those hit hardest by Sandy by FEMA, the Red Cross and the National Guard. NBC's Michelle Franzen reports. The government announced it would tap strategic reserves for diesel for emergency responders and waived rules that barred foreign-flagged ships from taking gas, diesel and other products from the Gulf of Mexico to Northeast ports. The moves could help to quell anger triggered by growing lines -- some of them miles long -- at gas stations. Less than half of the stations in New York City, Long Island and New Jersey were operating on Friday. New Jersey Gov. Christie ordered gas rationing in 12 counties to begin on Saturday under an "odd-even" system in which motorists with license plates ending in odd numbers would be able to buy gas on odd-numbered days. Experts say flooding in the Big Apple can be prevented in the future by building seawalls, levees or gigantic surge barriers. NBC's Richard Engel reports. Disaster modeling company Eqecat estimated Sandy caused up to $20 billion in insured losses and $50 billion in economic losses. At the high end of the range, it would rank as the fourth costliest U.S. catastrophe, behind Hurricane Katrina in 2005, the September 11, 2001, attacks and Hurricane Andrew in 1992, according to the Insurance Information Institute.